We are excited to announce that Verizon Wireless has committed to continue its support of the New Media Institute. 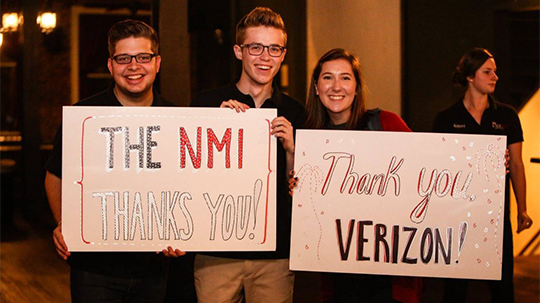 Verizon has been an invaluable supporter of the NMI for many years and we are so pleased that our relationship remains strong as the NMI continues to grow. Through a partnership this coming spring semester, the NMI Capstone course will work with a Verizon team to explore connected campus and community initiatives. The partnership will be supported by a gift from the Verizon Foundation for which we are so grateful! We would like to thank Julie Smith and the Verizon Foundation for all their NMI love!